Some of them had glazed over eyes. A few had gaping mouths in capable of uttering an answer. Those that were present might soon become part of the undead if the lights turned down. What was going on in this classroom? I couldn’t let this continue. I needed their brains. They needed their brains. No, not to eat. To learn mobile marketing. Ok. So the class wasn’t exactly like that. This past term I had one course that felt like I was fighting to get consistent engagement with my learners each week. 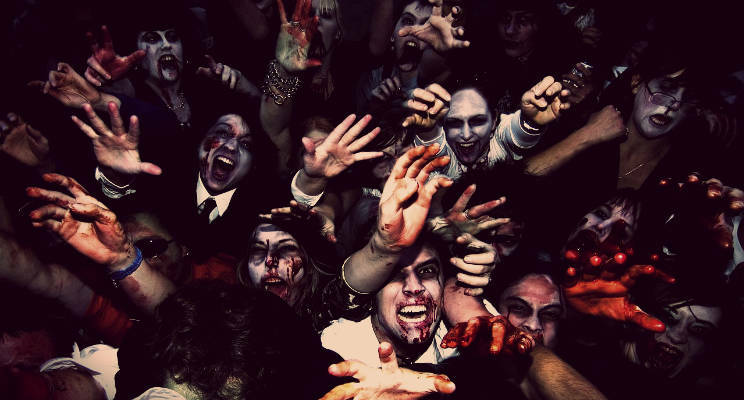 At times they were like zombies. Nice zombies, mind you, but their brains often seemed elsewhere. This not-quite zombie apocalypse was a point of friction. When I discover a friction point it usually sparks my creative problem solving instincts. I get curious. I start asking questions. Did context unknowingly encourage this zombie state? Despite our best efforts, how much do contextual factors influence the learning experience? This includes individual course scheduling and the physical or virtual space in which it takes place. As well as how each course fits into the overall program. I assume that not all courses should be considered equal. Determined not to let the zombies win, I started to explore our current context a bit further. Mobile marketing was an in-person class on Thursday afternoon from 12-3pm. My learners already had another in-person class from 8-11am; which often ended early leaving a gap of “wasted time” (the words used by a few of them to me) between them. Ours was the last class of their full-on week of learning. Both classes were in the same dreadful classroom. Don’t get me wrong, there are plenty of beautiful learning spaces at George Brown College. This, however, wasn’t one of them. The desks were lined up in long rows and difficult to move. A desktop computer with a square flat screen monitor connected to a podium off to the side of the room. There was an overhead projector and a single retractable screen. A wall with a handful of windows was off to one side. And the air circulation was handled by two units along the exterior wall. But we can’t consider this purely in isolation. I have a sense of what to expect from these learners. I had this same group in a previous term for social media marketing. That was an in-person class on Tuesday morning from 8-11am. It was one of their first classes of the week, and it was at the start of the day. The classroom was one of the newer ones at George Brown College. Despite it being an an interior class with no outside windows there were two sides of floor to ceiling glass, which made it quite bright. The podium was front and centre, flanked by two large flat screen LED displays. Two remaining walls, including the length of the front of the class, were floor to ceiling whiteboards. The desks were similar in both situations. With the same group of learners, the context between our social media marketing and mobile marketing courses was quite different. Now I have more questions than answers. I self-reflected week-to-week as I went through the term. I talked to my learners in this course about it. I discussed this challenge with my peers in professional development workshops at George Brown College. I did a bit of light online searching. I listened to a Freakonomics podcast that talked about the importance of identifying the root cause of a problem. Hmm…I feel like I’m on to something here? I wonder how much we truly consider, and I daresay understand, the strategic importance of context as influencing the program learning outcomes. In my experience with adult learning and college education most of the conversations I’ve been involved in have focused more tactically on individual course design, assessment and delivery. Yes, I’ve been in this industry for two years, and thus haven’t been exposed to program-level course planning or existing research on this topic. I’ve got assumptions about scheduling that some courses are better early in the week in the morning with nothing after them; while others can be done later in the week, possibly as the second one in a day, if they’re less intense and more self-directed. Additionally, how does the physical space or online learning management system contribute to context? This is a factor that we as program administration or faculty currently have less control over. Do we need to intentionally design the program context? When looking at how a program flows from start-to-finish, should we apply the same design thinking principles to its context–especially scheduling. My hypothesis is that the schedule is an important part of outcomes-based learning design and learner-centred lesson delivery. It’s more than simply filling in spots on a calendar each term. How do we prototype and test this? Perhaps we take the existing program in one semester and look at scheduling each course with empathy for the learners. What do we measure to validate it? Maybe its comparing student satisfaction feedback, student retention, or average grades. I’m not sure. I’m not there yet. To kill a zombie you need to destroy its brain. It’s kind of ironic, actually. Now I’m not suggesting we go around cutting off peoples heads. Lets just say that we need to get rid of the dead zombie brain and replace it with an active human brain. One that’s always engaged in the learning experiences we work hard to design and facilitate. That’s how we’ll kill the zombies in the classroom. In the end, we got through the mobile marketing course together. I made some adjustments to the weekly plan along the way, which ended up improving learner engagement. In my opinion, it ended up being fine. But “fine” isn’t good enough. This was a point of friction in the learning environment that I hadn’t experienced before. And in friction there’s opportunity for innovation. There’s opportunity for us to kill the zombies of learning.